Furnishings, light, grounds, room acoustics as well as communication- and media technique: The ORGATEC presents holistic solutions out of all relevant areas surrounding working and life space in the office as no other fair does. 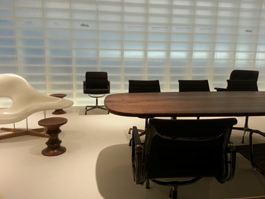 The Orgatec 2012 took place from the 23rd to the 27th of October in Cologne this year. 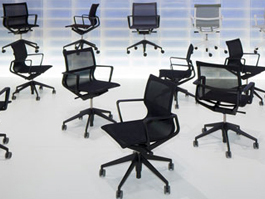 Numerous companies are presented on the Orgatec every second year, presenting their novelties out of office and object design. Whether furniture, illumination or room acoustics: the Orgatec presents innovative Solutions of the future. Vitra presented Workbay, a multifunctional system that offers many functions as work surrounding among others, by Ronan and Erwan Bouroullec. Whether as telephone cabin, video conference room, reading corner, coffee place or meeting point: Workbay re-defines offices and breaks the static office planning. With Physix by Alberto Mesa, Vitra presents a new swivel chair for the office, whose look reminds of the Eames classic Alu Chair, but which bribes by many new details and an astonishing weightlessness. The Physix construction is based on the idea of a continuous seat, by tensing fabrics between the lateral spars. Therewith the chair stands as final member in a long series of chair icons, but still developing the typology noticeably at the same time. Alberto Meda composes an interplay of three elements to one new dynamic sitting experience by the usage of current materials and production techniques: a flexible frame construction, an elastic knit cover and a stabilizing mechanism. The filigree frame construction of Physix uses the possibility of modern synthetics regarding flexibility and stability. The organic lateral spars out of polyamide are formable like a flexible hinge and follow the movement of the human body when lying back. There are things that one can’t improve, but make them nobler… also the conference chair classic by Charles & Ray Eames, the Aluminium Chair counts to these ones, one of the most exceptional furniture designs of the 20th century. Some editions of the Aluminium Group are now available in a “Dark Chrome edition with darker aluminium parts by Vitra. The seat coating has premium leather on both sides and its armrests are coated with high quality leather. This sophisticated material selection proves the usual silhouette of the iconic classic in a new, contemporaneous light. 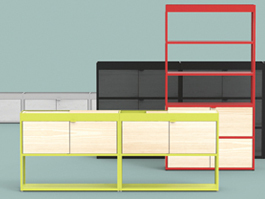 The shelving system New Order by the German designer Stefan Diez bribes with ist simple and flexible structure. The extremely changing shelf can be used in the office as well as at home and it can serve as single module as TV table or with several modules stacked becoming a complete books wall. Furthermore New Order might also be equipped with lateral walls and front doors becoming a complete wardrobe. The fittings and hinges of the New Order by Hay are especially innovative, since Stefan Diez made them out of transparent synthetics to make them nearby invisible. Whether sideboard, room divider, shelf or wardrobe wall: New Order is an economic attractive solution for many standard necessities in offices or at home with its simple configuration. Besides New Order, Hay also showed a furniture series by Ronan & Erwan Bouroullec. Initially designed for the University Copenhagen, the series consists of a chair, bar stool, table, conference table and a secretary. The stackable chair has a divided seat, which doesn’t only offer aesthetic advantages, but also flexibility when it comes to stack them. The table tops of the conference table and secretary are also divided, in order to make the gap between both boards usable as cable compartment. 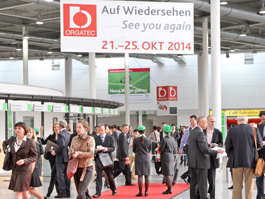 The this years‘ Orgatec was successful with about 600 expositors out of approx. 40 countries. Themes such as communication, cooperation, good feeling and high tech were some of the focussed topics this year. To keep going with the fast change of office solutions, some manufacturers presented versatile and adaptable pieces. At the same time some furniture pieces were presented that also acted as complete pleasant room, easy to be used at home. The fair also emphasized questions of right illumination of working places as well as innovative acoustic solutions in office areas.